Knowledge Swatches are simple and flexible tool to capture and make sense of research information as part of a design process. The Knowledge Swatch tool was developed by Hazel White and graduate design students at the University of Dundee to catalogue, make sense of and share design research in a useful analogue and digital format. One of the challenges for the designer (and others) is ordering research and development information into retrievable and communicable formats. The relationship and hierarchy of information is dynamic and comes in and out of focus as a project develops. We were looking for a way to catalogue, analyse and synthesise information in a creative and dynamic way during the design process, that was shareable and tangible with diverse project stakeholders. An important driver was to encourage students to demonstrate their understanding of research papers and relevant projects, rather than simply collect the information in an unreflective way. Designers gather information from a wide range of sources: observation of people, places, situations, books, academic journals, material tests, through sketching, taking photos, making prototypes etc. Traditionally this information might have been kept in sketchbooks, in ring binders, on desks and on walls. Designers need to carry this information with them: to share research, ideas and insights with a range of stakeholders throughout their project. We can of course catalogue information on websites, in blogs and in folders on our computer hard drives which makes it searchable and easily sharable over infinite distances with infinite numbers of people – which is great. What isn’t so easy, is to compare and make links between different pieces of information – as screen based systems are temporally restrictive as only one page is in view in any level of detail at a time. Also, importantly, whoever controls the display, determines how long each piece of information is discussed and how it related to other pieces of information. Knowledge Swatches are a hybrid of the textile designers ‘swatch’ and paper or card notes. Information is captured in any appropriate format: handwritten, sketched, printed-out, photos etc. The swatches should all be the same size (we have had success with sizes ranging from postcard to A4), so that they can be stored and ordered simply. The coding and organisation of the swatches is emergent depending on the designer or the project. My swatches are around A5 in size, each one having a hole punched into a corner for convenient attachment to the rest of swatches in the series or in this instance, case study. 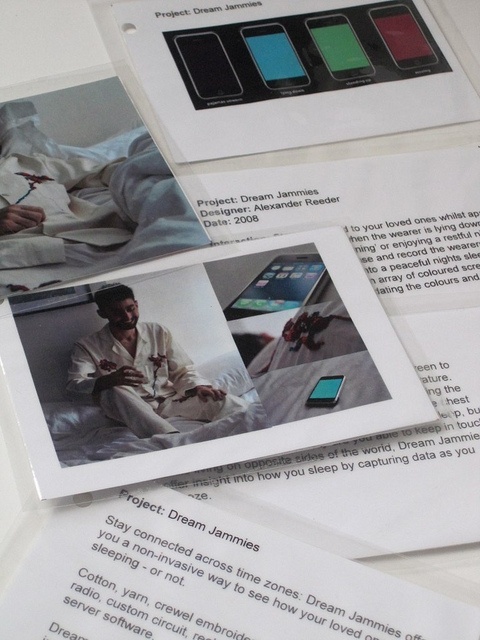 Each card contains either an image, a synopsis of the work depicted, a URL, Harvard reference or design diagram giving ‘snapshots’ of a project on one side. The other side of the card contains other information about the projects in the bundle, which can be used to sort the projects further in to sub categories. In this case they have been colour coded and symbol coded to signify different key aspects of the projects. This is useful as the user can, at a glance quickly and efficiently gain a good overview of the projects main elements without having to read the project synopsis. This is a useful time saver and can quickly sort projects by relevance. The individual swatches can be sorted and rearranged by the designer or user into any order or laid out into any format. An A3 analysis sheet can also be used as a conversation starter or thought provoker for the users (whether this be the designer or a participant). The analysis sheet encourages the users to consider all aspects of the swatch they are looking at and offer further comment, ideas, feelings and design suggestions. Engaging with the material instead of simply viewing the information on-screen will not only help the users to understand and digest the information but the combination of visual and physical artefacts has made tThe individual swatches can be laid out arrayed and re-arrayed to make connections, tell stories, create timelines and synthesise seemingly disparate pieces of information. They can be fastened together into themes or a complete ‘pack’. The distinctive nature of this tool is to capture, synthesise and communicate theoretical and practical knowledge in a physical and visual way as opposed reductive textual methods as part of a design process.